Oh the joys of spring. There is something about this time of year that brings me glee. Spring in Atlanta is truly beautiful with dogwoods and azaleas showing off their beauty all over the city. All the colors from the new blooms truly bring me joy, and motivates me to revamp my style. The new season means time to stock up on the most sought-after colors and fashion trends. Not only do I love being on trend with the latest styles, my daughter does too! I love dressing up with my little girl. And because she is her mother’s daughter, she loves dressing up too. 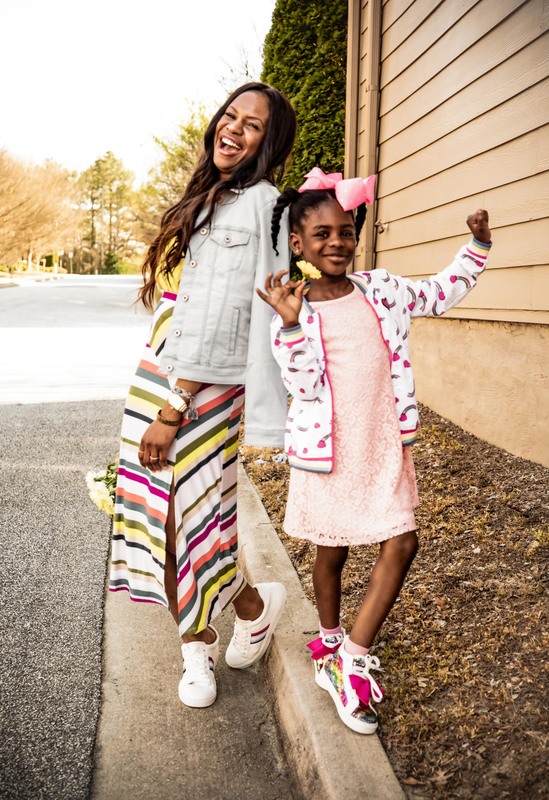 My little girl is just as much on style trends as I am, hence, we love creating mommy and me outfits that are not overly matching, but coordinate. The only downer about creating stylish looks that are on-trend for me and my daughter is that it can get a little pricy. That is why I partnered with Walmart create stylish and affordable outfits for my daughter and I. Bold Stripes, bright colors like yellow, midi skirts and denim are major spring fashion trends that I found at Walmart. My daughter wears her stripes in rainbows, and I match her with my stylish slit midi skirt (check out more ways to style slit midi skirts HERE). 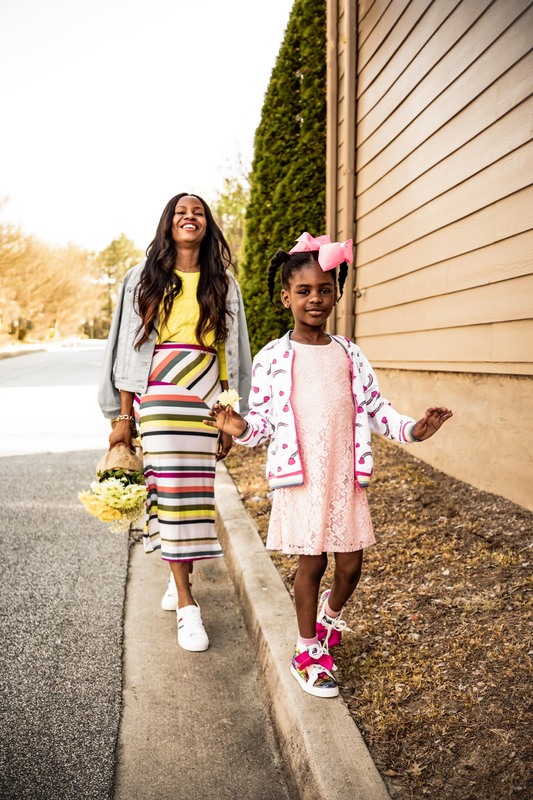 I love creating mommy and me spring looks that are not overly matching but tied together with colors and details. Beautiful soft spring colors like yellow and blush pink are whimsical, flattering and easy to wear for all. These colors are becoming the new neutrals as they pair perfectly with most colors. The sneaker trend has no intention of backing down and this pair is no exception. The multi-color stripes featured on my sneakers do a great job of complimenting my skirt. I complete the look with this very cool denim jacket! If there is one item that is guaranteed to return season after season, it would have to be the denim jacket. I love this option because it features the Love detail on the back. Who doesn't love a jacket with love! If you want to make a style statement this spring, and celebrate your unique style with your daughter, look no further than my friends at Walmart.